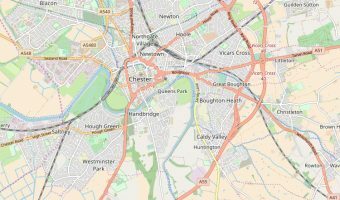 The cathedral city of Chester is the county town of Cheshire and one of the best preserved and most beautiful cities in the UK. Enjoying a strategic site on the River Dee it is an ideal destination for short breaks. It offers some of the UK’s leading tourist attractions, a great choice of places to stay and things to do, and is also a major retail hotspot. Chester and Cheshire offer a good range of accommodation options ranging from small family-run establishments to 5-star luxury hotels with spas. The Abode is a relatively new four star hotel with a great location overlooking Chester Racecourse. It offers 85 contemporary rooms with modern amenities such as flat screen TVs, iPod docking stations, and complimentary wireless internet access. The Michael Caines Restaurant on the 5th floor is one of Chester’s most fashionable dining spots and offers panoramic views of the racecourse and Cheshire countryside. Early booking is recommended when race meetings are held. The 5-star Chester Grosvenor hotel is one of the city’s most luxurious places to stay. Situated on Eastgate, close to the Chester Cathedral and the historic Eastgate Arch and Clock, it also the most central of the city’s hotels. Owned and named after the Duke of Westminster and his family, it has provided accommodation for the rich and famous since it was founded in 1865. The hotel’s signature restaurant, Simon Radley at The Chester Grosvenor, offers contemporary French cuisine and one of the most extensive wine cellars in England. It has retained its Michelin star since 1990. The hotel also boasts an extensive spa offering a full range of treatments. Chester was founded by the Romans in AD 79 who built a fort here and named it Deva after the Celtic name for the river Dee. Almost 2,000 years later the city still bears signs of its Roman Past. Construction of the City Walls began in Roman times and today it’s possible to walk the 2 mile circuit and view many of Chester’s finest attractions. The Roman Amphitheatre was discovered in 1929 and is the largest uncovered amphitheatre in England. 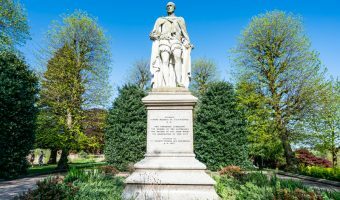 The Roman Garden contains numerous Roman artefacts discovered around the city while the Grosvenor Museum is home to a fantastic collection of Roman tombstones. With more than a million visitors every year Chester Zoo is the most visited zoo in England. It boasts over 7,000 animals and offers daily animal talks, play areas, and numerous places to eat and drink. Chester Racecourse is the oldest racecourse in England and, unlike most racing venues in England, enjoys a city centre location close to many of Chester’s hotels, restaurants, and bars. The racing season starts in May and runs until September. Tenpin operates bowling alleys at both Ellesmere Port and Chester. Other family-friendly attractions in and around Chester include the Blue Planet Aquarium, the Grosvenor Park Miniature Railway, Anderton Boat Lift, and Go Ape at Delamere Forest. With hundreds of independent shops and specialist stores Chester is a shopper’s paradise. Many are housed in the city’s unique galleried walkways; the Rows. Constrained by the City Walls, the centre is compact enough to explore on foot, and is almost entirely traffic free. The Grosvenor Centre is the main indoor shopping mall in Chester city centre. It is home to around 60 shops including high street names like Burton, Clarks, Browns of Chester (Debenhams), Dorothy Perkins, La Senza, Laura Ashley, Monsoon, River Island, The Body Shop, and Topman & Topshop. The Forum Shopping Centre, next to Chester Town Hall, is a smaller alternative. Cheshire Oaks at Ellesmere Port is the biggest designer outlet in England and features over 140 stores selling last season’s fashions at massive discounts. Brands available include Adidas, Armani, Ben Sherman, Burberry, Diesel, Fossil, Henri Lloyd, Jaeger, Karen Millen, La Senza, Lacoste, Mulberry, Next, Pringle, Reebok, Ted Baker, Timberland, and Tommy Hilfiger. The Coliseum is a retail and leisure development right next to Cheshire Oaks. Stores here include Argos, Currys, Game, HMV, JJB Sports, Maplin, and M&S. The site also offers a cinema, bowling alley, nightclub, and a good selection of restaurants. The Greyhound Retail Park is a large shopping park on the outskirts of the city. It boasts the first John Lewis at Home store in the North West plus stores such as DFS, Pets at Home, Argos, Comet, Halfords, and SCS. The Chester Retail Park and Deva Retail Centre are also here. The Broughton Shopping Park is also nearby and offers over 20 stores including Tesco, Bhs, Boots, and Asda Living. Chester boasts excellent transport links and is easy reached from other parts of the country. Chester train station is situated just outside the City Walls and offers direct trains to Cardiff, Manchester, Birmingham, London, and many other destinations. The station also forms part of the Merseyside network, offering trains to Liverpool, Birkenhead, Southport, and more. Liverpool John Lennon Airport and Manchester Airport are easily reached from the city. Between them they offer flights to most UK and international destinations. National Express offer direct coach services to Chester from various towns and cities including London, Manchester, Liverpool, Oxford, Birmingham, Leeds, Glasgow, Carlisle, and Preston.